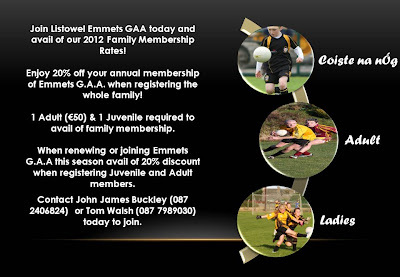 Please note that Emmets are offering special family membership rates for 2012. Enjoy 20% off your annual membership of Emmets G.A.A. when registering the whole family! When renewing or joining Emmets G.A.A this season avail of 20% discount when registering Juvenile and Adult members. One adult membership (€50) & One juvenile membership required when availing of this offer. Contact John James Buckley (087 2406824) or Tom Walsh (087 7989030) to join.